Crab Relleno (Rellenong Alimasag) is a popular Filipino dish that is made out of crab meat and vegetables stuffed in crab casing. This is one yummy crab dish so easy to eat but very difficult and time consuming to make. 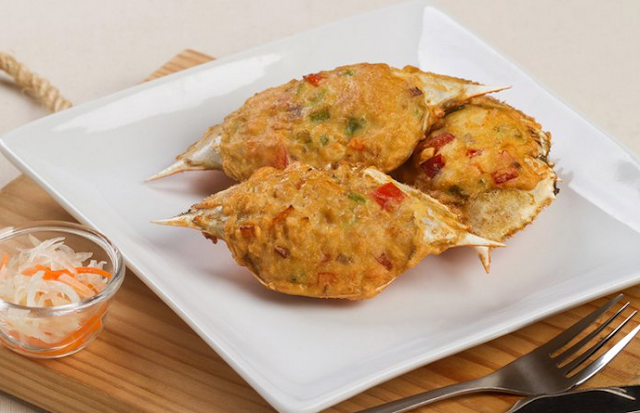 A picture-perfect dish made from succulent crab your guests won't soon forget. 1. Boil the crab until fully cooked, approximately 5mintues. After allowing them to cool, gently flake the crab meat apart with a fork. Reserve the crab shells. 2. Combine the crab meat, onion, garlic, ginger, bell peppers, carrot, coconut meat, coconut cream, flour and egg. Gently mix to fully combine.